Woke up in Watson Lake at 2:15 AM. It was light out. Couldn't get back to sleep. Later, heard a couple drops of rain on my tent. I jumped up and was packed and ready to leave by 5 AM. 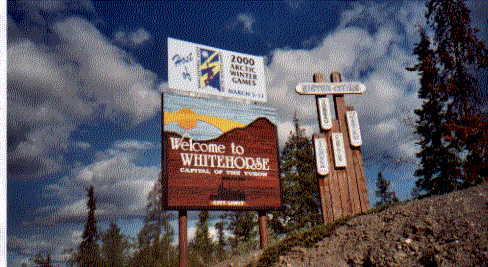 Drove to Whitehorse. Drove all day again. 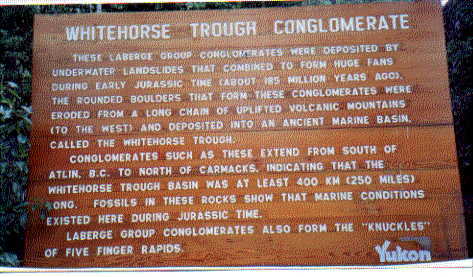 Arrived in Whitehorse, Yukon around 3PM. Exhausted. Couldn't decide what to do. I had come to a split in the road (the only split). I could either continue north toward Fairbanks (which was STILL a long way to go--about 600 hard miles) or I could take the only other road--it lead south towards Haines, Alaska. This was my last chance to turn, head south, and still make it to Alaska. I could even catch a ferry in Haines and take it all the way to Bellingham, Washington. Nothing to worry about, relax, sleep, enjoy the cruise--the heck with the cost. Or, I could keep going. All the way! I'd never be back here again. Now's my chance to see the REAL Alaska! Go north! Go north! So it won't be easy--I can do it! 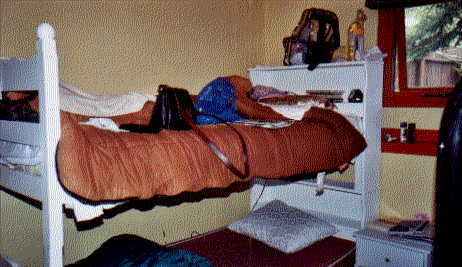 Above: Newly opened Beez Kneez Hostel, Whitehorse. Found a phone booth, and called my son, Luciano, at work just to say, "Hello", tell him where I was, and the decision that I was trying to make. Sometimes it helps to talk to someone else. His co-worker answered the phone. Luciano wasn't in the office. So I asked the man to tell Luciano that his mother called to say, "Hello from Whitehorse in the Yukon." Decided to drive a little ways into Whitehorse to see what it looked like. Maybe if I found someplace to stay, I'd stay. Then, like a miracle, I saw a very little sign low on the roadside. 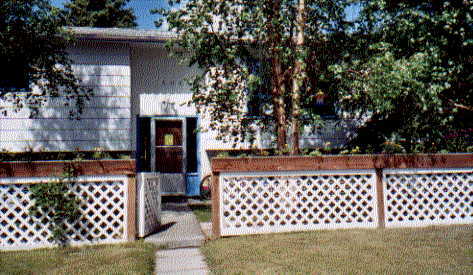 It said, "Hostel" and pointed toward Whitehorse! That was it! That was all I needed to decide whether or not I was going to take the road south to Haines or stay on the road north to Fairbanks. 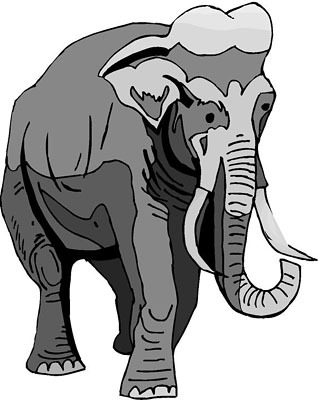 Fairbank it was! 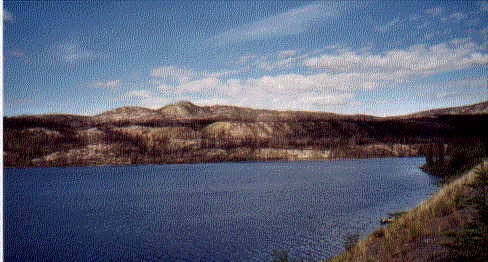 Left: The Yukon River. 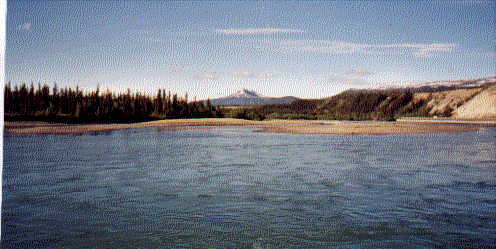 Photo taken from the dock in Whitehorse. 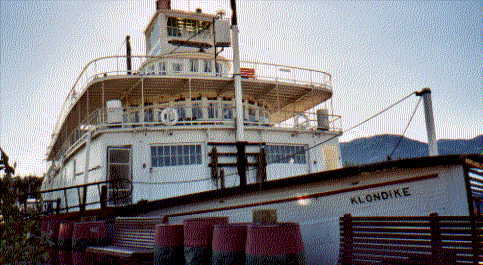 Below: The "Klondike" on the Yukon. 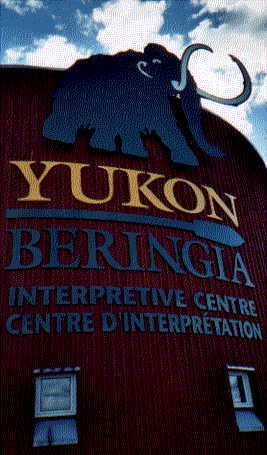 Left: Visited the "Beringia" Interpretive Center just outside Whitehorse..
Nope, it's a Woolly Mammoth. Above & Right: After I left Whitehorse and headed towards Dawson City, I drove by mile after mile of forests devestated by wildfires. 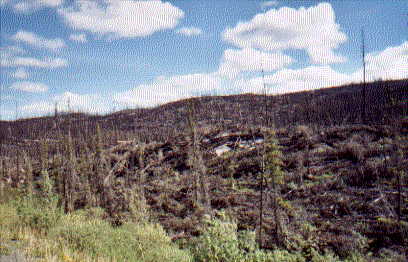 ALL the vegetation was destroyed. And this was from a fire that happened DECADES ago! I read that it takes an extremely long time for the forests of the far north to recover because there is such a short summer season. What's that? 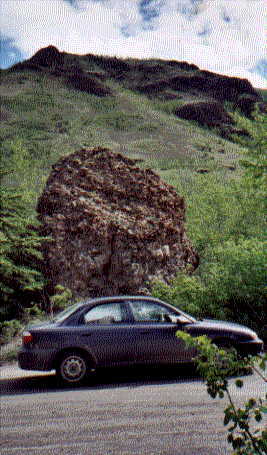 There's one in the picture on the right--that big "rock thing" that had my car parked in front of it. Left: Further up the road I stopped restaurant/general store for a cup of coffee. 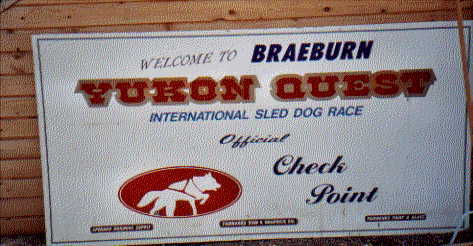 The store was also the "Official Check Point for the Yukon Quest Dog Sled Race. Left: If these dogs look like they were in "attack mode", the were! I now know where the phrase, 'let sleeping dogs lie' comes from. Here's what happened. When I walked into the store for coffee, the dogs were fine and friendly when I walked by them. 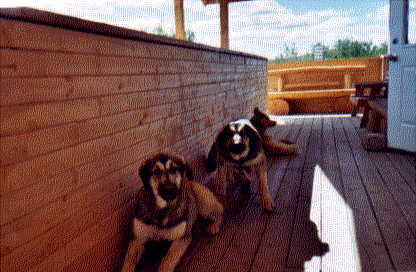 When I came out of the store and saw them quietly asleep on the porch I just had to take their picture. So I crouched down, pointed my camera. Snap! They moved so fast I caught them in "mid-attack". But they didn't bite. They just jumped up, lungd at me showing their teeth and placed their growling muzzels firmly against my thigh. I froze and let out a little yelp of my own! The owner ran out and got the dogs by the collar. I explained that it was my fault. I should have thought ahead that it might startle them to wake up to someone kneeling down about 2 feet from them and flashing a light in their faces. No harm done. I'll never do that again.